Classic City Classic 2016 is in the books. A quirky schedule made for short games on Saturday and some rosters were not yet fully set, but CCC proved to be what it was billed to be — a primer for the 2017 Southeast season. Georgia Tech came away the big winners, but plenty of other stories emerged. Here is what was learned about every team on the weekend. Wreck announced themselves as the real deal at CCC. The team came into the weekend as the favorites in the Southeast and their performance in Athens underscored that status. Georgia Tech won nearly all of their games with ease — the only exception was going down 6-1 to a gritty South Carolina team before coming back to win 8-7, proving they are just as capable of winning ugly. The team was perfect in pool play, stomped an otherwise impressive Georgia team in semifinals, and then beat Kennesaw State for the second time on the same day to win the final 15-7. Ashley Brown and Taylor Hartman both played to expectations and the team got contributions throughout the roster, as is the team’s defining characteristic. Allison Wong is a very solid number two handler to pair with Brown and even with Dana Rose out with an injury, the team had plenty of downfield options beyond just Hartman. But the real standout for Tech this weekend was Ollie Peterson. Peterson is a rare player in the Southeast region, coming in as a freshman already with elite experience and playing ability. The game seems to move slower for her than anyone else on the field and she brings the confidence, field awareness, and game knowledge of a fifth year senior. If she were put in a position to carry a heavy load for the team — which she won’t, due to the team’s ethos and playing style — she would already be in the conversation for best player in the region. She is a huge addition to a team that already has some players at the top end of the region, and seems very comfortable with her role in the team. It should go without saying, though, that Georgia Tech did not have a perfect weekend. It is the fall, after all. At times, the team’s D-line waited for the opposing offense to turn the disc, rather than forcing turnovers through high-pressure defense. That works in a fall tournament against the teams Tech played this weekend, but they’ll need to more consistently generate their own break chances to compete with the teams they’ll be playing at Queen City Tune Up and Centex in the spring — and the teams they hope they’ll be playing at Nationals. Before any of those tournaments get underway, Georgia Tech’s roster will get a big boost. The team’s 2015 Callahan nominee and All-Region first-teamer Julia Ting will be back with the squad in the spring. Ting was one of the best players in the region last year, and, already very familiar with the Georgia Tech system, she will be a huge addition to the team for the regular season. With the addition of Ting, and the return of Rose, Tech already has a very easy means of improving on their strong CCC performance. For the first time in program history, Tech will enter the competitive spring season as the favorites in the Southeast, having absolutely cemented and lived up to that expectation in Athens. Prior to the tournament, I said that this year was a great opportunity for a non-traditional team in the region to emerge and make a real post-season push. Kennesaw State used CCC to announce themselves as part of that conversion. The team went undefeated on Saturday, and their only two losses on the weekend were to Geargia Tech, who they played tighter than any other team did. They were the beneficiaries of a weaker Pool B, but they crushed Florida State in their semifinal matchup, proving they weren’t only capable of winning against the lesser teams in the region. 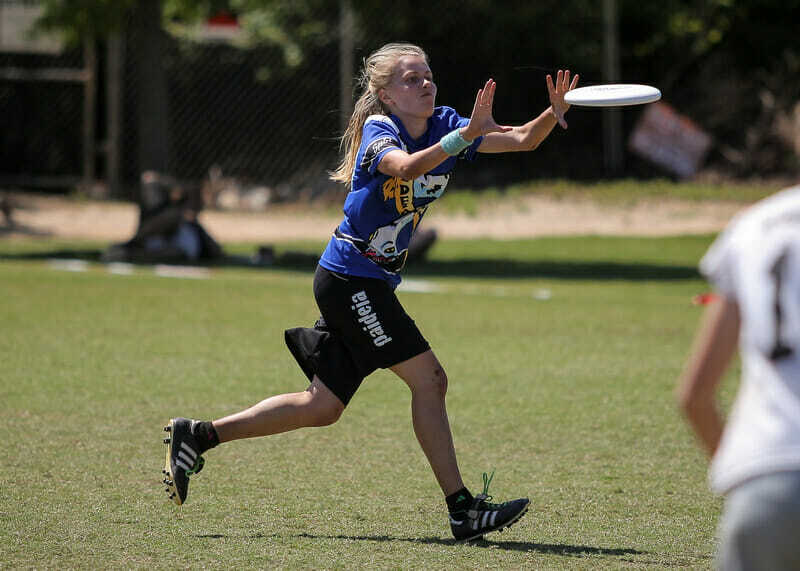 Strix is led by Ozone player Samantha Daugherty, who was oftentimes the best player on the field this weekend. She’s supported by the likes of Rachel Mez and Grace Clough, and coach Sam Stovall has her squad playing strong team defense. Stovall knows the team has improvements to make, but hopes that the team can continue its upward growth and earn a second bid for the region. Tests at some bigger tournaments than the program is accustomed to could prove whether Kennesaw State has that potential, but they definitely had as strong a fall as they conceivably could have had. Another team that saw its stock rise sharply after CCC is Georgia. Dawgma beat Florida and Florida State on Saturday, and then beat them both again on Sunday to prove the wins were no fluke. Their third place finish was well deserved and they appear to be much improved from a season ago, in spite of losing some talented players. Erin Chun showed that she’s not just a veteran player on a young team, but she’s one of the best players in the region. She unquestionably sets the tone for the team with her on-field play, playing all but one point in a pre-semi against Florida on Sunday morning and bringing a complete performance with highlight reel throws and displays of athleticism. Mary Virginia Hahn put herself in that elite category as well. She doesn’t look the most physically imposing player at first glance, but on the field she gets open at will while often being covered by the opposition’s best downfield defender. Second year players Alex Fairley and Samia McEachin both impressed as well and Stephens has the still-young team playing tremendous defense. It should also be noted that Georgia was without important offensive weapon Gracie White on Sunday, as she is still recovering from an injury. Georgia came into the fall as a team that still looked a year away from really competing at the top of the region, but their performance at CCC showed that they are ready now. The team has some work to do, especially against zone defense, but the team has the top-end talent and defensive pressure to compete now, particularly if some of their younger players continue to improve. Florida State had a strange weekend. The team won just two games to go 2-5 on the weekend, but they still made semifinals and lost on double game point in the third place game. The Seminole Ladies had their biggest struggles against zone defenses — something of a theme across the entire field — and it’s evident that the team is lacking in handlers that are confident and dynamic enough to really tear apart resolute defenses right now. Sophomores Lindsi Allman and Natalie Dix are both promising complements to veteran Lauren Brooker, but neither quite have the ability to take over a game just yet. But it was not all negative for the Seminole Ladies. Three of their losses came on double game point and easily could have been wins. A couple of potentially strong players emerged for them over the weekend as well. Freshmen Courtney Read and Natalie Wilson are two impressively athletic and speedy rookies who could become monsters once they learn the game. Read, in particular, looked dangerous as an O-line cutter, showing remarkably impressive timing and field awareness for a player of such little experience. If she learns how to throw and continues to learn the game, she could become an important player for FSU as early this season, and has the potential to be a standout for them in future seasons. FSU has a good, young core that should get better through the spring and that should give them optimism despite this tournament having more downs than ups. Florida had a pretty strong tournament overall, and will feel their fifth place finish behind Florida State is probably undeserved. They finished 5-2, with a double game point win over their in-state rival and only missed out on semifinals due to a double game point loss to Georgia in what was the game of the tournament on Sunday morning. Fuel’s success came with some interesting line decisions as well. The team’s first year coaches Kate and Dustin Travaglini looked to work in some new handlers, while using some of the team’s more experienced throwers further downfield. If the plan works out, then Florida will have something that not many teams in the region possess — cutters who possess dangerous throws. The team still managed to win most of their games despite the inherent growing pains that come along with such a decision and if the move works out, it give Fuel a real edge over their regional foes during the season. Lucy Berman seemed to be the biggest benefactor of the switch, as she put pretty flick after pretty flick downfield to the likes of Courtney Testa and sophomore Gabby Krajniak, who looks poised for a breakout season. Florida’s defense also impressed, often using a zone look that did a nice job of taking away underneath throws and forcing deep shots that Danielle Cordes would nearly always clean up. Florida used the weekend as a chance to progress ahead of the regular season, and even in doing so, still showed that they have plenty of tools to compete at the top of the region. Auburn was without Kristine Fedorenko, who was relegated to coaching from the sideline by a recent surgery. Still, Auburn managed to go 4-3 on the weekend, with their three losses coming to Georgia Tech, Kennesaw State, and Florida. Without managing to beat any of the top teams at the tournament, they appear to have been surpassed by KSU as the team likeliest to shake up the region. Still, though, the team has plenty of positives to take away from posting a winning record without their top player. South Carolina was a tough opponent for several teams this weekend and nearly had a very special tournament. They went up 6-1 on Georgia Tech behind Rhoxie Ellard’s “grip it and rip it” handling style before Tech went on to score seven of the next eight points to win on double game point. Scorch then lost another lead and double game point game in the ensuing round against Auburn, but proved to be a physical and tough opponent all weekend. Scorch is a young team, but under second year coaches Andrell Caldwell — who is coaching full-time for the first time this season — and Hunter Frady, they seem to be headed in the right direction as a growing program. Virginia Tech had an interesting weekend. They topped their pool on Saturday, with wins over Georgia and Florida State, but offered little resistance to Florida State on Sunday morning in their pre-semi matchup, lost to Auburn in consolation play and then forfeited to South Carolina in what would have been their last game. Brianna Knaggs and Anna-Britta Pincus are nice players, but until the Burnettes put together a more complete tournament, it is tough to tell exactly what kind of team they will be this season. Emory was a reverse Virginia Tech last weekend. They overcame a dreadful Saturday to go undefeated on Sunday, with comfortable wins over North Georgia and UCF in consolation. The team’s zone offense showed marked improvement in the second day of the tournament, and with a young team led by promising sophomores Anna Glass and Leah Gilbert-Odem as well as junior Sarah Burzynski, that resilience and bounce-back ability are promising for the future. Still, their Saturday performance was worrying, and the team has plenty of improving to do if it wants to make any serious noise in the region. For North Georgia, this was their first real tournament in their first official year as a club. Considering the age of the program, they had a pretty impressive weekend. A win over UCF, no matter how much they lost from a year ago, is impressive for a program in its infant stages. They resemble Kennesaw State when they first started, and with program commitment and good leadership, perhaps they could show similar growth over the next handful of seasons. UCF had a nightmarish time in Athens. The team lost all of their top performers from a season ago, but this kind of drop-off feels unprecedented. The team went winless and was outscored 15-70 on the weekend. Chloe Baldino has to be commended for her leadership qualities as the only significant returner to play last weekend, but she is surrounded by a remarkable amount of inexperience. Coach Joe Tilley was at a wedding and unable to attend CCC, but even his return shouldn’t be expected to generate a significant enough immediate impact. Right now it looks like the Sirens are at least two years from being nationally relevant again. The fall season is now over for most teams around the country. There’s a long wait until January and February when these teams will start playing in regular season tournaments, but this past weekend presented a pretty good glimpse at what some of the predominant Southeast story lines will be in 2017. How will Georgia Tech fare against some of the top teams in the country? Is Kennesaw State a real contender? Is Georgia? Florida? Does a young Florida State or any of the second tier team make enough improvements to push the teams at the top? All of those questions won’t be answered for a few months, but CCC 2016 gave a nice little taste of what to look for and expect when the college season really gets going. Comments on "Georgia Tech Wrecks Competition At Classic City Classic"